Fredericksburg, Texas (Aug. 7, 2018) - One thing that unites us as a nation is land; Americans strongly support saving the open spaces they love. Since 1999, Hill Country Land Trust (HCLT) has been conserving land through conservation easements for the people of Central Texas. Now HCLT announced it has renewed its land trust accreditation proving once again that it is committed to professional excellence and to maintaining the public's trust in its conservation work - along with over 400 other accredited land trust across the nation. "Hill Country Land Trust's accreditation renewal provides a wonderful opportunity to look inward and assure that our organization is healthy and vibrant as we continue to work with landowners throughout the Hill Country to preserve the working lands, clean water, long vistas and functional ecosystems that we all love," said Romey Swanson, HCLT Board President. Accreditation is an important distinction for land trusts. 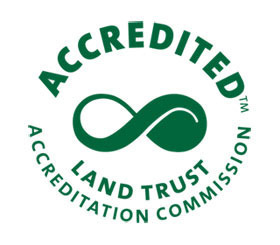 The accreditation process shows a land trust is committed to ensuring excellence in land conservation by demonstrating their commitment to the Land Trust Standards and Practices. The 12 standards provide ethical and technical guidelines for land trusts to follow to maintain strength, credibility, and effectiveness. George Barr, Treasurer of the HCLT Board of Directors, added, "Land trusts help land owners achieve their conservation goals for generations to come. Being an accredited land trust demonstrates the importance HCLT places on being a well-managed organization continually working to execute our fiduciary duty as well as our conservation mission. 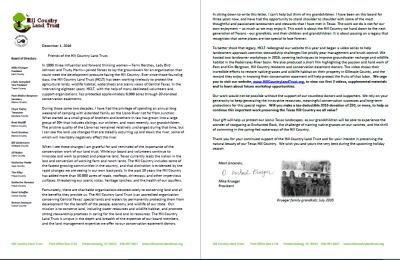 HCLT has a history of supporting land owners with their conservation goals and we look forward to continuing this work with land owners who want to be good stewards of their land for future generations." As part of the accreditation renewal process, Hill Country Land Trust provided extensive documentation and was subject to a comprehensive third-party evaluation in order to achieve this distinction. The Land Trust Accreditation Commission awarded renewed accreditation, signifying its confidence that HCLT's lands will be protected forever. Accredited land trusts in Texas now steward 1.6 million acres - an area of land roughly twice the size of Big Bend National Park. For more information about the Land Trust Accreditation Commission , visit www.landtrustaccreditation.org. For more information about Land Trust Alliance, visit www.landtrustalliance.org.